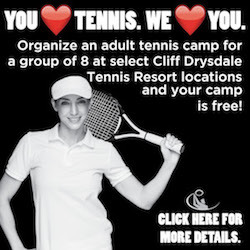 Tennis Resorts Online has a single purpose: to provide tennis vacationers with information about where to go. As such, it is the ideal landscape for resort and camp advertisers or for anyone seeking to reach avid tennis players. Tennis Resorts Online offers a variety of options, from simple text to graphics of various sizes as well as combinations of text and graphics. That gives you as an advertiser great flexibility while offering options to fit any budget. The system is also designed to allow you to make changes at will, at no cost (provided the ad size does not change), throughout the ad's run. Moreover, every ad is fully trackable, and you'll have real-time, 24/7 access to impressions. Clickthrus are tracked using Google Analytics.. Rates are extremely reasonable particularly given that Tennis Resorts Online reaches a narrowly targeted market. To submit or change an ad, please login to interactive advertising.